According to one media report, the newest study by Duke scientists (published on Monday) shows that gas drilling in northeastern Pennsylvania did not contaminate nearby drinking water wells with salty water. But flip to a different paper and you learn that same study concludes that fracking does indeed put drinking water at risk from fluid migration. The "truth" is more complex, and the study more nuanced. Introducing their paper, the Duke researchers mention that the drilling debate raises concerns about the potential for methane, metal-containing brines and hydraulic fracturing fluids to migrate into drinking water aquifers. A critical question, they say, is whether there is any "hydraulic connectivity" between the deep shale gas formations and the overlying drinking water aquifers - and if so, to what extent. 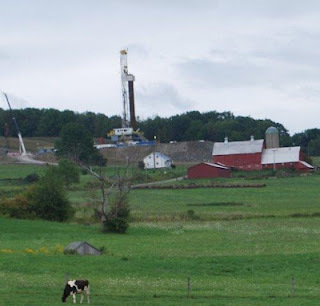 Introducing their study the scientists say, "We present geochemical evidence from northeastern Pennsylvania showing that pathways, unrelated to recent drilling activities, exist in some locations between deep underlying formations and shallow drinking water aquifers." They show that salty water (brine) does indeed migrate, but is not correlated to the location of shale-gas wells. "However," they add, "the presence of these fluids suggest conductive pathways and specific geostructural and/or hydrodynamic regimes in northeastern PA that are at increased risk for contamination, particularly by fugitive gases" because of the natural connections to deeper formations.So, yeah, the possibility of migration is there because the geology surrounding the Marcellus Shale is already fractured with pathways that could allow contaminants to move more freely than expected. You can read the study here. Fortunately, the Department of Energy is conducting research that may provide some answers to the question of whether drilling fluids migrate and how far they travel. DOE researchers are working with a drilling company at a commercial well site in southwestern PA. The are adding tracing elements to hydro-fracking fluids and will conduct follow-up monitoring. They hope to see whether drilling fluids move upwards and/or sideways through the shale. Using tracers isn't new - they're routinely used in hydrologic studies. Like the Duke study, the DOE tracer study will help researchers learn more about the geology surrounding the Marcellus shale. And like the Duke scientists, the DOE researchers caution that Marcellus geology is variable, changing from place to place. What is Act 13, Anyway? The Next Generation says Don't Frack Us!